Anyone have any luck porting over a landline phone number to their FreedomPop phone? I get the error message "The LOA authorizing person is too long. The LOA authorizing person should be not longer than 15 characters" when I try. Not sure what to do to resolve this error. Any help is appreciated. The phone number is currently with AT&T. @Margaret Palecek‌ In order to bring your old number over to FreedomPop, start by logging into your FreedomPop account. From there go to My Account > Phone Number > And select Transfer Existing phone Number. You may need to contact your previous carrier to have your device "unassigned", but be sure to NOT cancel your previous account until the port is successful. For a video guide to porting your number, please click here. When you get to the point where you need to enter in the information for porting your number here is the information you will be entering. AT&T Landline - Account # is the 9-digit phone number and the PIN is the 4 digits to the immediate right of the phone number in the top right corner of your bill. 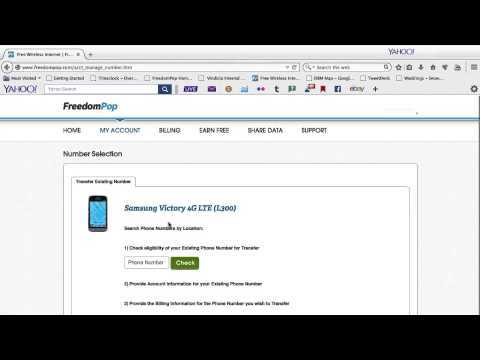 Have you verified yet if your number is eligible to be ported in to Freedompop? Yes, it says it is eligible. Thanks for the suggestion, Richard Allen, I will try that, and post back if it's successful. So, the number porting seems to have worked, and my account now says "You've successfully completed the Phone Number Transfer process!" But - I can't make or receive calls on my FreedomPop phone, and my old phone doesn't work anymore either. When I call my home number from another phone it just rings forever. When I try to call out with my FreedomPop phone, I get the message "We're sorry. Our service is currently unavailable. Please try again later". I've tried restarting the phone, but I don't know what else to try. It's a Samsung Victory 4G LTE. Have you tried logging out then log back in to your messaging app? 2) tap force close then tap clear cache. 3) Do a complete power down power on cycle. 4) once boot up is complete launch the messaging app and log back in to your FP account. When login is completed you should see the number you ported in to FP. If you are still unable to make calls on your phone you will probably need to contact one of the admins or call customer support. They will be back in on Monday.